Yell have long been renowned for their industry-leading and increasingly popular fully managed website services. Perfect for those who need a helping hand when building their website, Yell offer bespoke packages that will suit a range of businesses. The difference with Yell is the fact that they design, build, write, and manage your entire website. They’re also an established Premier Partner of Google, which means all sites built with Yell are mobile and search engine optimized. This makes them an ideal choice for those who want to leave their site to the experts. And, the journey with Yell begins with an in-depth one-to-one consultation. Yell isn't just a company offering website services. After a personalized consultation, they will build you a complete website with their copywriting and design skills. They’re a long-standing firm who have a vast amount of experience in the online world, which is sure to give you confidence that your website is in safe hands. You’ll also be given as much input as you desire. So, if you have a specific design, their web builders will listen to you and tailor your site to your requirements. Or, if you haven’t got the time, you can leave it all up to them. 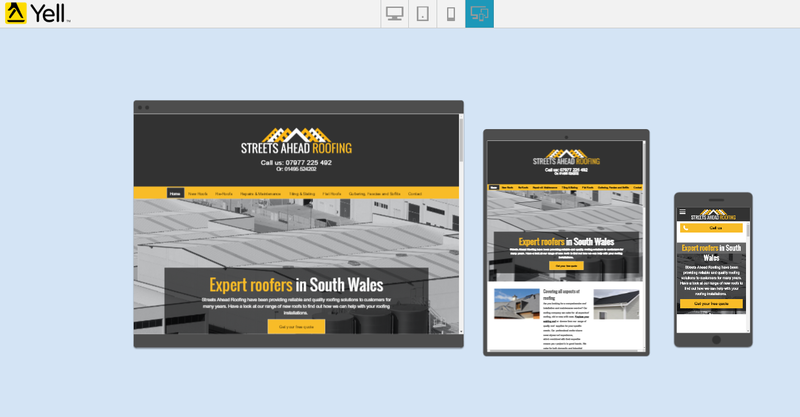 With three different website packages available, you can choose one that’s going to be in-keeping with your company requirements and budget. You’ll also be able to take peace of mind that every additional aspect of your site can be taken care of. This includes mobile-optimization, pay-per-click advertising, and e-commerce features. With these features, Yell provide you with a professional approach to building your site. Unlike many other DIY websites, you’ll be given expert help along the way. This helps to make sure the site you’re building is going to reach out to customers, drive them to your website, and convert them into valuable leads. It’s clear that Yell offer a complete package, as there are a number of must-have additional features on offer. These include pay-per-click and display advertising, which will help to boost your site’s visibility. There’s also e-commerce specific add-ons for online stores. There is, of course, the fact that you’ll get your site listed on Yell. This is something many others have to pay for and it’s a valuable source of traffic. You can also add to this with advertising on the site. Propelling you to the top of Yell listings, it’s an incredibly powerful tool for getting ahead of competitors. With all of these additional marketing features, Yell help your business to stand out from the crowd. The pricing offered by Yell is very reasonable, especially considering the fact that they’re doing a lot of the work for you. The first fees you’ll have to pay are for the building of the site itself, with three packages being available. The cheapest package (Premium) is £499 upfront, but is currently available to new customers for only £299. This package includes 10 designed pages, personalization, and 1 new page every 3 months. The Premium Plus is £999, but is currently available to new customers for only £799. It includes all of the Premium features plus a personal design consultation, a review of your site every 3 months, and the inclusion of 10 existing pages. Then there’s the Elite package, which is for those looking for a truly bespoke and responsive website. All of the standard features are offered as well as up to 15 bespoke pages, responsive design, an on-site photo shoot, competitor strategy, monthly reports and the option of a video or animated background. Finally, there are their monthly fees, which include things like site hosting and additional services, e.g. e-commerce tools or content management systems (CMS). Yell are available by phone, email and live chat. This offers you quick, efficient resolutions to any problems or queries you may have. There are also how-to guides, online tutorials, and FAQs that cover all the bases for you. All-in-all, it’s not hard to see why Yell website builders boast a 9/10 when it comes to customer satisfaction.